It must be odd for Albertin Aroldis Chapman de la Cruz as he looks around training camp, thinking about how things unfolded at the trading deadline last year. On July 25, 2016, the lives of five players were forever changed. Chapman was sent to the Chicago Cubs for ultra-prospect Gleyber Torres, the consummate swingman Adam Warren, talented upper echelon prospect Billy McKinney, and the lesser known Rashad Crawford. Three outfielders and a pitcher for the flame thrower. For Chapman, we know how the path developed. He went to the Cubs and helped them win their first World Series since 1908. He lived the dream that eludes so many players. Derek Jeter might not be the best person to ask how hard it is, but I am sure that Don Mattingly can explain. Now, having re-signed with the Pinstripers, Chapman is back in camp with the familiar interlocking N-Y and putting up his usual one inning of zero’s every few days. But as he throws his pitches, he is reminded of those he is directly responsible for bringing to New York. 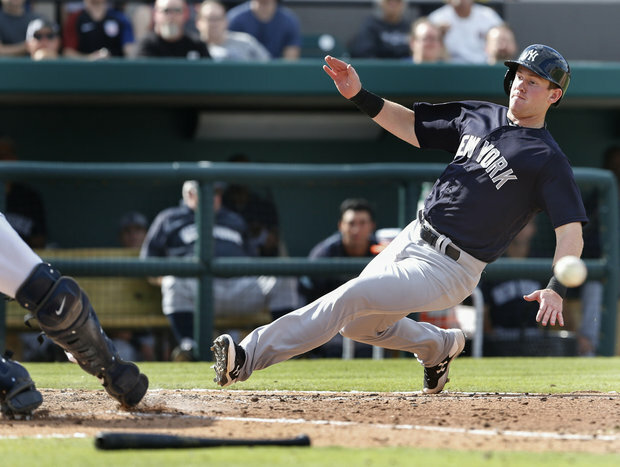 Aside from Warren, the former Yankee who is a better fit for the Yankees than he was the Cubs, and Torres, now the organization’s top prospect, we have Billy McKinney, who might be the forgotten piece to the puzzle. McKinney was originally a first round selection in the 2013 MLB Draft for the Oakland Athletics. He ended up in Chicago, thanks to the Jeff Samardzija trade a couple of years ago. At the start of training camp, I wished the best for McKinney, who was born in the same town, about the same time, as my daughter (in Plano, Texas). I thought McKinney would get a few at-bat’s and then become one of the early departures for re-assignment to minor league camp. Yet, here we are on March 19th, and McKinney is still producing for the spring-time Yanks. He’s played in 15 games, and currently carries a .412 batting average (7-for-17). Three of those hits have gone for home runs. He has also driven in 7 runs. He has walked three times and has only struck out once. McKinney is showing that he can be part of the Baby Bombers movement and is serving notice to Aaron Hicks that he had better perform if he intends to keep his job. I don’t expect McKinney to make the Opening Day roster, but I think he has opened eyes and made people realize why he was once a first-round pick for the A’s. He becomes the lost man in the Chapman trade, along with Crawford, given so much attention focused on Torres. It is very possible that the day will come when Chapman will share the major league roster with at least three players he is directly responsible for bringing to New York. It’s also within the realm of possibility that McKinney could be setting himself up for yet another trade, given the depth of outstanding young outfielders in the Yankees system. Regardless of what happens, I am very happy to see McKinney find success. He is showing that he has a future in Major League Baseball. Thud. Just like that, the Yankees lost their latest spring game yesterday when Aneury Tavarez homered off the newly signed Ernesto Frieri in the 9th inning. The Yanks were unable to answer Tavarez’s homer in the bottom of the frame and the Baltimore Orioles prevailed 5-4. The Yankees dropped to 16-6 with the loss. To Frieri’s credit, he did finish the 9th with 3 strikeouts. Speaking of losses, Dellin Betances is headed back to Yankees camp. Thanks to Team USA’s elimination of the Dominican Republic from the WBC, it’s time for Betances to pull back on the pinstripes. I am sure that he will be a welcome sight in Tampa, along with coach Tony Pena (Team DR’s head coach). Congratulations to Team USA for the 6-3 victory! With no offense to either Betances or Pena, I always love to see the season of Joey Bats ended prematurely. Team USA will now advance to the WBC semifinals against Team Japan. Enjoy your words, and your work. Very good. A tremendous plus to Daniel's site.